If you consider yourself a member of the creative class, then you know one of the trickiest skills to master is staying innovative. To be a successful blogger or online personality, you must keep consistent with a killer spread of content that keeps you competitive online. So, what do you do when you hit an inspiration roadblock? When I feel myself sinking into a creative slump, listening to podcasts is one of my surefire methods to re-energize. Hearing others talk enthusiastically about their experiences, ideas, and reasons to keep going always seems to do the trick – and fast. Plus, there are so many podcasts out there now that it’s easy to keep on the prowl for new and great gems to get excited about. For those who aren’t already addicted, here are seven of my favorites that cater to creatives – some older, some newer, but all equally inspiring. CYOP is a weekly interview series featuring change-makers from various creative industries, from blogging to food to glass-blowing. The host, Jennifer Snyder, goes behind the scenes with entrepreneurs of all kinds from all over the U.S. (Literally. She did an 8700+ mile solo road trip to conduct interviews) to explore the motivation behind their endeavors. Snyder’s friendly interview style draws out honest answers from her subjects about their past, their struggles, and what it took to get to where they are. It’s a really easy listen that’s relatable and conversational. Make it Happen is a weekly podcast for bloggers and other creatives by Jen Carrington, the writer and creative coach behind the online creative resource Jennypurr. It started just earlier this year. Carrington aims to “help you stay inspired and take some really purposeful and practical steps forward for your blogs and creative businesses,” as stated on her site. 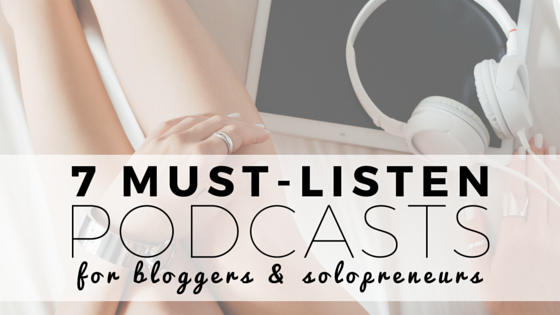 Most of the episodes feature an interview with creative types, like bloggers and entrepreneurs. She also features a few solo episodes where she explores topics more in-depth on her own. This one shares practical advice and is typically under an hour – perfect listening for your commute. Emily Thompson and Kathleen Shannon are the voices behind Being Boss, a podcast for creative and passionate entrepreneurs who want to narrow in on their “core genius.” These two are a powerhouse of optimism, and they talk shop in such a way that it feels like a creative coffee date with friends. Expect interviews with top-notch guests sharing real-world advice on how to establish and grow your business online. They even share tips worksheets, meditations and tool recommendations – if you sign up for their bundle. Keep an eye out on the site for secret episodes, too. The Fizzle Show is a weekly podcast for the community of “creative entrepreneurs and honest business builders who want to earn a living doing something they care about.” The hosts, Corbett Barr, Chase Reeves, Barrett Brooks and Steph Crowder, speak from their experience on a broad range of topics from making great content to growing an audience and work-life balance. The strength of this show really is the dynamic between the hosts. They’re authentic. Their tips and tricks are real and immediately actionable. And, better yet, they have jokes. There’s rarely ever a second of dead (or boring) air space. Cortnee Loren Brown’s Creative Start is the result of a daydream. Brown wanted to create a scenario where “artists felt comfortable supporting and teaching each other, rather than fearful and protective of their secrets.” In each podcast, she interviews creative entrepreneurs about how they got their start. “Learning from the path that others have taken was the first step that I took at the beginning of my creative career,” Brown says, on her site. I love origin stories and these are really inspirational. The show currently is on hiatus. But, you can look forward to new episodes this fall. 6. RAISE YOUR HAND. SAY YES. Raise Your Hand. Say Yes. is the brainchild of business and branding coach Tiffany Han. This podcast shares the “creative experiences of (extra)ordinary people” in what is very much the digital equivalent of the a kick in the pants. She pulls back the curtain on the path of many well-known names in effort to inspire passion and action in her listeners. For any maker looking to get started on a new project – or just get started altogether – this podcast will help you get out of your own way. The Lively Show is a weekly podcast designed to “add a little extra intention to your everyday.” If you’re not already familiar with the podcast, you may know the host Jess Lively from her blog. Episodes are focused on Lively’s values-based approach to possessions, personal habits, relationships, and career. There is a strong emphasis on the blogging world, but her interviews go beyond the niche to cover creatives, small business owners, and other genuinely awesome people. In the almost two years since she started, the podcast has garnered over a million downloads and is consistently ranked among the top podcasts in iTunes.